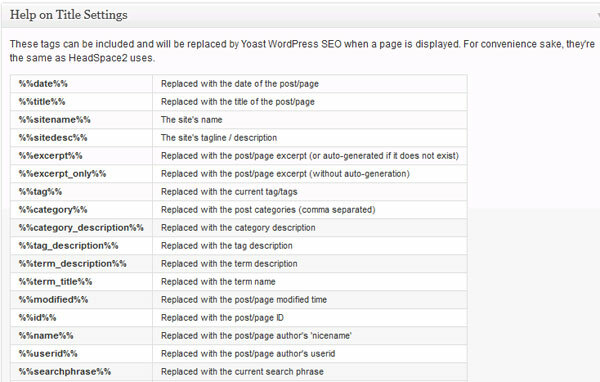 In this tutorial you will learn the basic SEO rules to follow when adding posts to your WordPress blog and how to use YOAST WordPress SEO plugin to optimize the blog content. Pay maximum attention to your blog post title. A typical WordPress installation uses the post title for: the HTML title (appears on the very top of your browser as in the screenshot below), the URL (read the point below), and the <h1> tag of the page. Exactly the 3 most important SEO content elements. It’s paramount. Therefore, when planning for a new post, you probably have in mind the idea the post needs to communicate. The post title should be very clear what the post is about and include the keywords that you think people will use in Google to find your article. 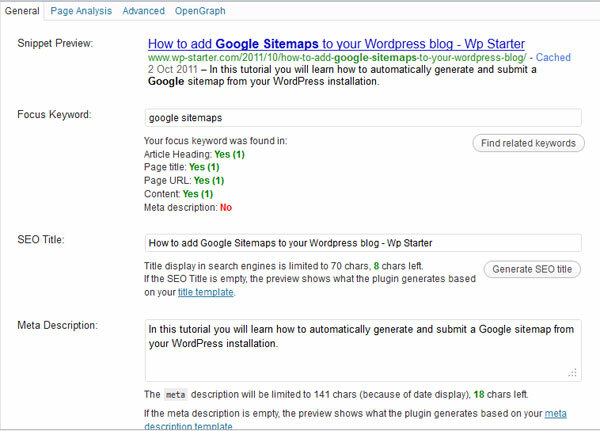 In my post I used as an example for the screenshots I wanted to talk about google sitemaps and wordpress so the keywords I wanted to make sure I have in the title were: google sitemaps and WordPress. You can also see the permalink which I describe below. The permalinks. Search engines will rank higher the pages that have an URL with related keywords to the content of the page. But, the default WordPress installation makes links to posts something like www.mysite.com/?p=123 which is not very SEO friendly. As explained above, WordPress could make the URL out of the post title with the right settings, so you should make them. 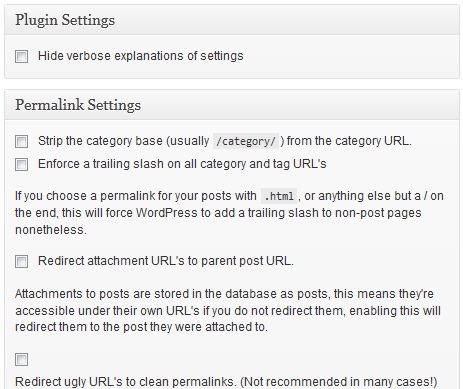 To do these settings look into the WordPress dashboard and in the “Settings” menu go to “Permalinks”. I usually go for month and name. 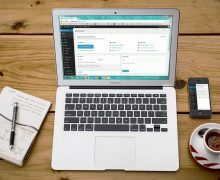 This will set WordPress to automatically create the URL to your post from the date of publishing and the keywords from your post tile (and you can also manually adjust the created permalink). Headings. Search engines place a good deal of importance on the headings available in the content. Most probably the <h1> tag (the most important) is created by WordPress automatically out of the post title, so you should take care of the <h2>, <h3> tags. This means you shouldn’t write plain text to your posts. You should divide the content into sections and for each section come up with a heading title that is relevant to the page and that section. It helps the readers and it help SEO. Keyword density. If your post is about Google sitemaps and WordPress and these are the keywords you want people to use in the search engines to reach your page, then these keywords should appear in a reasonable amount in the post content. 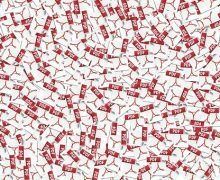 Overstuffing keywords is bad, not having enough is bad as well, so you need a good balance. Internal linking. When you are writing a post, in some cases there might be some related posts you already wrote that could bring more details to the reader. So, why not link from specific words to the relevant related content? It helps the reader understand better what you’re writing about, and it’s good for SEO. 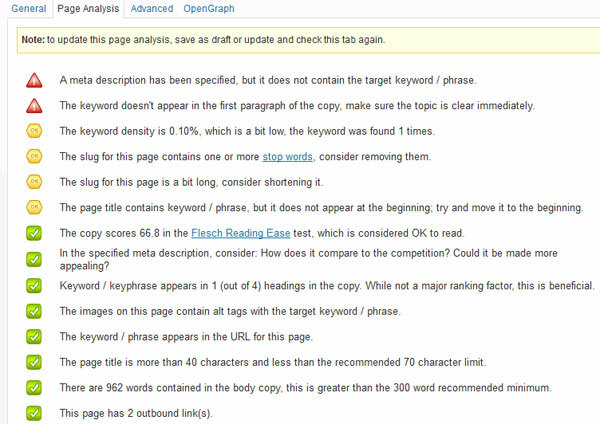 Now, of course you can do all these SEO optimizations on your content quite easily, but you need to do a bit of outside research and check manually or with a tool how your page is looking SEO wise after publishing the post. 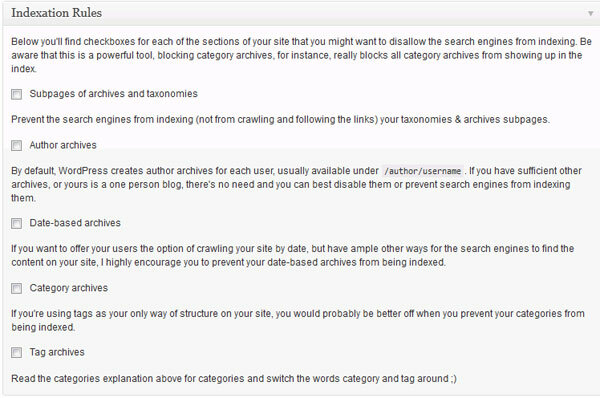 There are also quite a few SEO plugins that help you add a better HTML title and Meta Description to the page. The usual process is something like this: you write the title thinking about the keywords => write the content => publish the post => check the page’s SEO => edit the post to make SEO improvements => publish (update) again => check for SEO. Quite time consuming. Or you could use the YOAST WordPress SEO plugin and do all these on the fly; what makes this plugin differently is that besides giving you the options to better manage the HTML title, meta description and other SEO related elements for the entire blog, it evaluates the post content from within the “Add new post interface” and lets you know what should be improved. So it cuts the need of an external SEO tool. Installation is quite typical; download the plugin from here, upload it to the “wp-content/plugins/” folder and go to the “Plugins” menu in the WordPress dashboard: Locate the plugin in the list and click on “Activate” (if you don’t find it, make sure you are in the inactive plugins list (click on the inactive link, just above the plugins list) Once is activated, a new menu called SEO will appear bellow all the other menus in the WordPress dashboard. 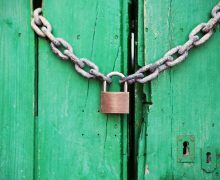 If you go to the “Indexation rules” menu, the plugin will give you the ability to block some sections for Search engines. 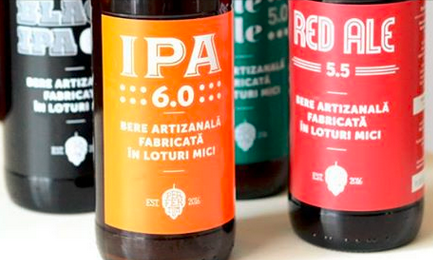 Why it might be good? By default, WordPress generated more views for the same content (which search engines don’t like because it’s duplicate content). Therefore it might be good to block for example the author categories. But as the plugin warns, use with care! 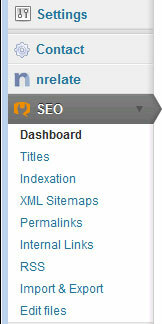 The “XML sitemap” menu gives you the option to create a XML sitemap. However I like to have better control over it, and you can install a separate WordPress XML sitemap plugin. The “Permalinks” menu gives you access to more advanced settings over the typical WordPress permalinks (which you should enable from the Common settings window as explained above). However I feel these are a bit of an overkill. The “RSS” menu comes quite handy. 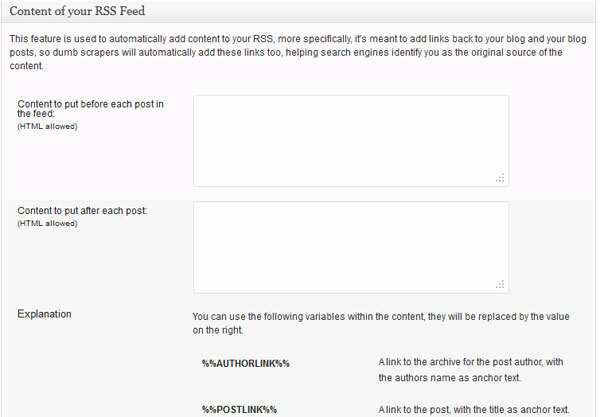 It allows you to easily customize the content of the standard WordPress RSS output. The Snipped Preview shows how the page will look like in Google searches. It gives you an overall idea on the page title, link (URL) and description. In the Focus Keyword field, fill in the most relevant keyword for the page (what you want people to use in Search engines to find your page). Tada! It gives you a quick view on how well you did SEO wise on the article heading, page title, page URL, content and meta description. 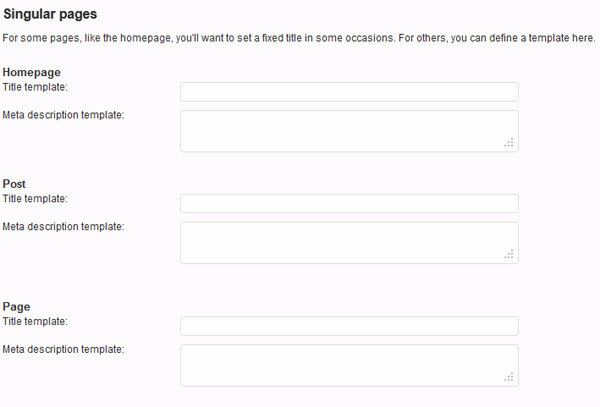 The Meta description let’s you make a custom meta description for the page (the default template is created on the settings you did in the “Titles” menu – see above). The “Page Analysis” tab The “Page Analysis” tab is even cooler. It gives you a quite detailed overview on how your page is standing SEO wise. It gives you an insight over the keyword usage throughout the content, links, images, ease of read and more! The “OpenGraph” tab It’s a bit unrelated to the rest of the functionalities but, the “OpenGraph” tab comes in handy if you are publishing the pages to Facebook. You can customize the description of the page (what Facebook will show as a page description). Enjoy!